The Civil War is seen anew, and a great American family brought to life, in Robert Roper’s brilliant evocation of the Family Whitman. Walt Whitman’s work as a nurse to the wounded soldiers of the Civil War had a profound effect on the way he saw the world. Much less well known is the extraordinary record of his younger brother, George Washington Whitman, who led his men in twenty-one major battles—from Antietam to Fredericksburg, Vicksburg to the Wilderness—only to nearly die in a Confederate prison camp as the fighting ended. 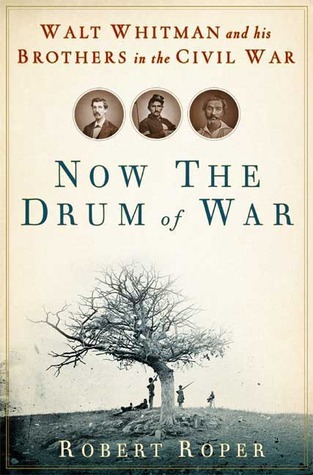 Drawing on the searing letters that Walt, George, their mother Louisa, and their other brothers, wrote to each other during the conflict, and on new evidence and new readings of the great poet, Now the Drum of War chronicles the experience of an archetypal American family—from rural Long Island to working-class Brooklyn—enduring its own long crisis alongside the anguish of the nation. Robert Roper has constructed a powerful narrative about America’s greatest crucible, and a compelling, braided story of our most original poet and one of our bravest soldiers. Walt Whitman was an American poet of the mid nineteenth century, best known for his work, Leaves of Grass. The Battle of Antietam was fought near Sharpsburg MD in 1862 and represented the bloodiest single day in American military history.